Georgia-Pacific recently announced that it would not longer purchase trees from certain Endangered Forests and Special Areas, which was hailed as a major victory for forests. The Company’s policy statement was developed in consultation with various environmental groups such as National Resource Defense Council (NRDC), the Rainforest Action Network, and Dogwood Alliance. 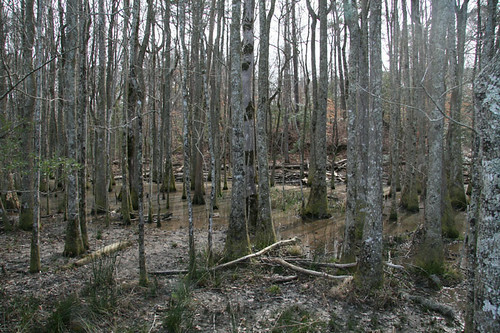 Scientists and environmental groups identified 11 Endangered Forests and Special Areas totaling 600,000 acres in the Mid-Atlantic Coastal Eco-Region as well as 90 million acres of natural hardwood forests in the Southern region. Future mapping of similar Endangered Forests and Special Areas in other regions will be implemented. In addition, Georgia-Pacific took a stand against the expansion of pine plantation, which tree farms have replaced natural forests. Pine plantations lack biodiversity and require extensive pesticides to help the pines grow quickly to ward off pests. These chemicals can find their ways into neighboring streams causing human health impacts in nearby communities. To date, 20% of Southern forests have been converted to pine farms. At this rate, over 60% of Southern forests will be converted by 2040. Why are these Southern Forests Endangered? For more specific information about why each of the 11 areas are endangered, read here. I interviewed Hammel, vai email about Georgia-Pacific’s bold move. For the last five years, Hammel has focused her energy to protect the forests of the southern United States, which from the diverse private industry pressures including the international pulp-and-paper industry. What prompted the dialog between the NRDC, Dogwood, and the Rainforest Action Network and Georgia -Pacific? Georgia-Pacific initiated the dialogue with the environmental groups more than six years ago. That is when the company began the process of examining the expansion of their policy to increase protections for hardwood forests and endangered and special forest areas, resulting in this statement. Why did it take six years for Georgia-Pacific to reach this decision? The company spent six years, in collaboration with the environmental organizations, mapping forests and determining protected areas. All parties to the dialogue wanted to ensure that there was an established methodology ready for implementation before the statement was made public. The extent of mapping undertaken by GP truly sets the company’s efforts apart. What did you feel was the most compelling arguments that finally got Georgia-Pacific to agree to not buy trees from the endangered forest areas? Georgia-Pacific voluntarily made these changes to their practices in response to the growing market demand for more sustainably produced materials. Companies are realizing now more than ever that they can do right by the environment and still prosper financially. Why was this agreement only for certain Southern forests? What about Western and Northern forests? The policy statement covers all Georgia-Pacific operations, but the mapping has begun in the South, GP’s primary sourcing area and the largest paper-producing region in the world. GP has committed to expand its mapping of endangered and special forests throughout all of its sourcing regions in years to come. Where will Georgia -Pacific buy its trees from for its paper products if they no longer are buying from the endangered forests? Georgia-Pacific has adequate resources from which to harvest outside of the protected areas. These sources include already-established pine plantations and other sources that will not involve the conversion of natural hardwood forests. If they are buying from “managed forest” and if so, what does that mean? Managed forests fall into two categories – plantations and natural forests. Georgia-Pacific will continue buying from plantations that do not replace natural hardwood forests, as well as from natural forests — outside of the identified endangered and special forests — that are managed for timber production. Is it possible to get Georgia-Pacific to buy trees from only FSC certified forests so that it brings the bar up for other forests to become FSC certified? From NRDC’s perspective, it would be ideal to get Georgia-Pacific to only harvest from FSC certified forests. Increasing the amount of forests that are managed to the FSC standard is a primary objective for our organization. We will continue to work with Georgia-Pacific and other companies to move them in this direction. Are you seeing more companies that will be signing on to the same agreement as Georgia-Pacific? Or do you see that the group has a long way to go to get more companies aboard. Yes, over the past several years, large corporate consumers have been asking suppliers for assurances that their wood and paper products are sourced responsibly. This demand continues to grow and corporations such as Georgia-Pacific understand that in today’s competitive marketplace, wood products companies need to have a meaningful sustainability position to remain competitive. The fact that a major industry leader like Georgia-Pacific is now initiating system-wide change is a testament to the cultural shift toward sustainability. What can the public do to help get more companies to not buy trees in endangered forest areas or stop the creation of pine plantations. Consumers can encourage companies to embrace sound environmental policies by choosing products that are sustainably sourced according to rigorous and credible standards – such as the FSC. Nothing speaks louder than the power of public choice, and the influence of our collective spending power is substantial. There are still companies operating in endangered forests and special areas around the world. Consumers, governments and conservation organizations all have an important role to play in ensuring that our forests—and all of the values they provide –are maintained for future generations. Why are these areas not Federally protected? While some areas are federally protected, those areas are surrounded by both public and private lands that do not have the benefit of federal protection. For those areas, this agreement was critical to ensuring long-term protection. What about the other Paper Players? My hope is when one player raised the bar that others are forced to follow. International Paper and KFC, I hear the call. Don’t you? How do you think this will impact the paper industry? Thoughts about International Paper and KFC?